I bought my first Sheltie in 1977 to do obedience with, never realizing that nearly 40 years later I would still be in love with the breed and be breeding and showing with some success!! My First Shetland Sheepdog Ob. Ch Stornaway-Sno-Wonder did me proud, took me to Crufts on four occasions and has bred on to keep the line going. 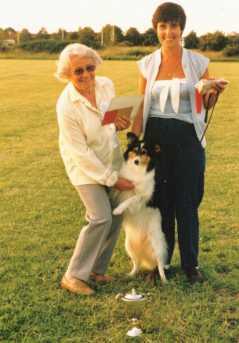 'Purdy' as she was called became an Obedience Champion on the 7th July 1985 and at the time of writing there has not been another Shetland Sheepdog Obedience Champion.